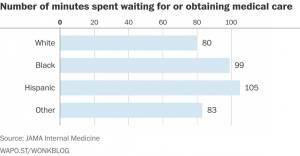 Black and Hispanic people also spent nearly 10 minutes longer traveling to their appointments. A short study released Monday by JAMA Internal Medicine found that minorities wait, on average, 25% longer to obtain medical care than do whites. 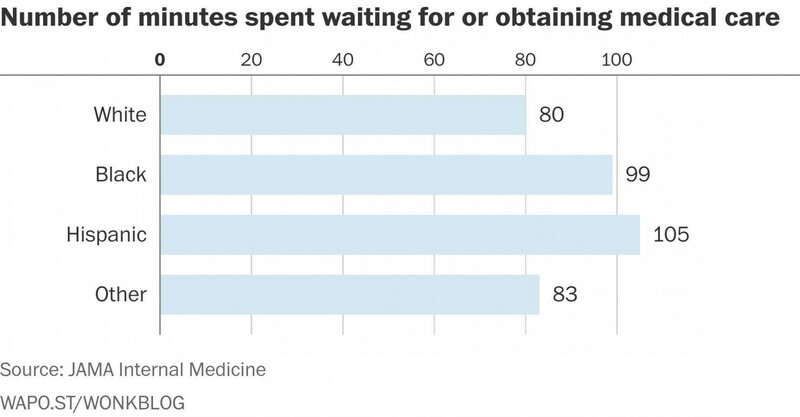 The period waiting for care, or “clinic time” for White americans was about 80 minutes. For African-Americans it was 99, and for hispanics it was 105. The data suggest that minorities are spending more time interacting with the medical system in other ways: by waiting, or by engaging with the administrative parts of medicine. Black and Hispanic people also spent nearly 10 minutes longer traveling to their appointments, which added to the time cost of going to the doctor. The authors and an accompanying editorial acknowledge that some of the difference may be accounted for because people are seeking care in different kinds of clinics. But bias of the hospital staff could also be a factor, as The Post notes. Alexander Green, associate director of the disparities solution center at Massachusetts General Hospital, said he had administered a study a few years ago that showed doctors did sometimes have unconscious (or conscious) biases that affected patient care - from how aggressively they treated them to how hostile they interacted with the patient. It logicaly follows that other hospital adminstrators would exhibit similar biases, adding minutes to the avergage person of color's wait time. How much of the gap is specifically comprised of these forms of interpersonal racism is unknown, but similar studies on unconscious racial bias suggest it's likely non-trivial.